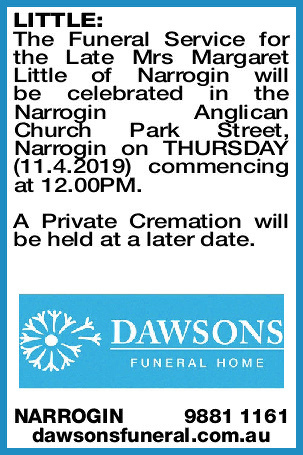 The Funeral Service for the Late Mrs Margaret Little of Narrogin will be celebrated in the Narrogin Anglican Church Park Street, Narrogin on THURSDAY (11.4.2019) commencing at 12.00PM. 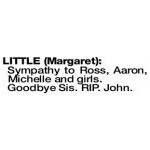 A Private Cremation will be held at a later date. 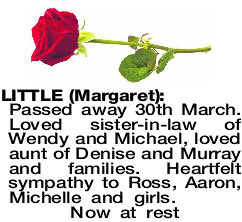 Sympathy to Ross, Aaron, Michelle and girls. 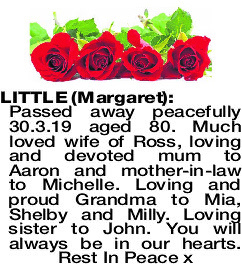 Passed away 30th March. 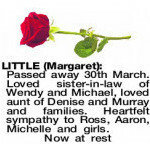 Loved sister-in-law of Wendy and Michael, loved aunt of Denise and Murray and families. 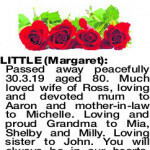 Heartfelt sympathy to Ross, Aaron, Michelle and girls. 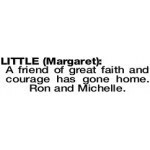 A friend of great faith and courage has gone home. Ron and Michelle.